Since 1925 when the noted African American historian, Carter G. Woodson, started Black History Week, which was later (in the 1960s) expanded to Black History Month, February is known, the world over, as a period to study the great accomplishments of people of African descent. This year, the Brooklyn Chapter of the Coalition for Public Education is presenting a forum, “What To Teach Our Children About Our History/Heritage”? The event will be on Saturday February 5th, 2011 at the Bed-Stuy Restoration Main Building at 1368 Fulton Street between New York and Brooklyn Avenues on the 5th Floor. 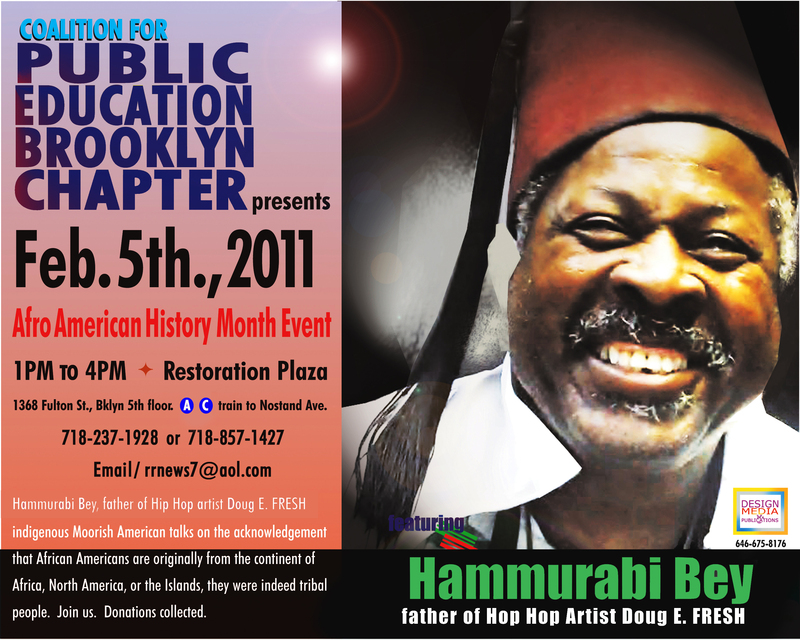 Speakers for the event include Mr. Hamurabi-Bey, the father of hip hop legend Doug E. Fresh and an expert on Moorish History; Dr. Safiya Bandele, Director of the Women’s Center at Medgar Evers College; Mr. Basir Mchawi, host of “Education at the Crossroads” heard every Thursday at 7 p.m. on radio station WBAI 99.5 FM; and the publishers of the BlackFax Calendars, an encyclopedic reference to our history. The event is free and will begin at 1 p.m. sharp on Saturday February 5th. For information, please call (718) 237-1928 or (718) 857-1427. Books will be available. This entry was posted in Black History Month and tagged African American History, Black History and Culture, Black History Month Celebration. Bookmark the permalink.